Marina Abramovic: The Artist is Present (2012) is a documentary about one of the world’s pre-eminent performance artists. If that sounds truly boring, never fear, because the film is much more than that. When I saw the film, I was expecting something pretty dry, despite the film getting uniformly positive reviews everywhere I read. The delightful thing about the film is that yes it is about performance art, but it is also about so much more. It is about the notion of legacy, boundaries, the psychology of art, physical limits, the monetisation of creativity and best of all, it is one of the most awesomely strange love stories I have seen for quite some time. The reflections on her working and personal relationship with her longtime partner Ulay are some of the most intriguing parts of the film. We are talking about a relationship that culminated in an artwork that saw them walking toward one another from opposite ends of the Great Wall of China, an act that so changed them that it was the end of their relationship. There’s was a real love, ultimately combustible, but incredibly reflective. It is not often that you get to see the parties involved reflect on something that has burnt out in such a way and it is riveting stuff. 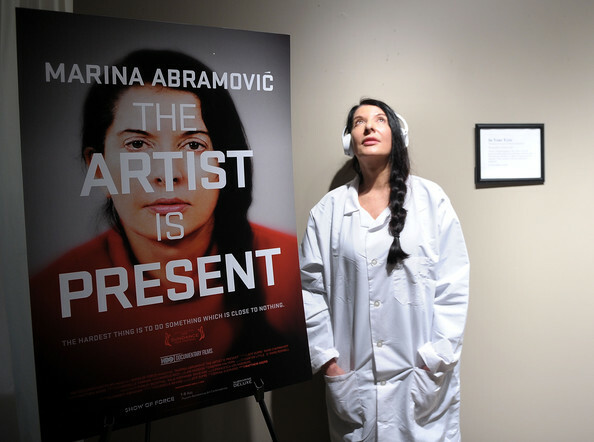 Definitely not what I was expecting, Marina Abramovic: The Artist is Present, is well worth checking out. Give it a shot even if the premise sounds about as enticing on nails on a chalkboard, I’d be willing to guarantee that the film surprises you in some way. Rare is the film that sees you actually engaging with an artwork, but I think that is one of the many things that this film achieves.